This blog provides updates on important policy developments related to science education in Georgia. These updates are also provided directly to our members via email. Much of the information here is provided by our legislative consultant, Mr. Tyler Kaplan of the J.L. Morgan Company. While the blog is available to the public, only GSTA members may post comments. In the early hours of the morning on March 31st, 2017 the Georgia General Assembly completed its 40-day legislative session and adjourned “Sine Die.” After adjournment, the Governor has 40 days to sign or veto bills. If the Governor does not sign or veto a bill, it will automatically become law. The Governor has the power of line-item veto over the budget bills. Below is a comprehensive summary of the most relevant pieces of legislation that were filed and considered in the 2017 session of the legislature. HB 139, sponsored by Rep. Dave Belton (R-Buckhead). This measure is intended to provide for transparency and accuracy of the financial information of local school systems and schools. It would require the Department of Education to make publicly available on its website the budget and expenditure information for each school. Status: The legislation was approved by both chambers and is now on the Governor’s desk. HB 237, sponsored by House Education Chairman Brooks Coleman (R-Duluth). This bill, which has been characterized as a piece of legislation meant to support the intent of HB 338, would authorize the Public Education Innovation Fund to receive private donations that could be used as grants for public schools, and establishes a tax credit for such a donation. The legislation was changed in the Senate to reduce the maximum amount of tax credits available to $5,000,000 and sunset the law on December 31, 2020. HB 338, sponsored by Rep. Kevin Tanner (R-Dawsonville) is school reform legislation intended to give the State Board of Education more authority to intervene in chronically failing schools. Late in the session the measure was renamed the “First Priority Act” and was amended to include a change that prevents for-profit entities from operating state schools under the terms of the legislation. A change was also made to the formation of the education turnaround advisory council in order to include more representation from the education community and their respective associations. Additionally, the State Board of Education instead of the Superintendent of Schools will appoint the Chief Turnaround Officer who will have substantial authority over the turnaround process. Finally, $1,000,000 in funding for the implementation of the bill was added to the conference committee report on the fiscal year 2018 budget and a provision was included in HB 338 that creates a Joint Study Committee on the potential establishment of an accreditation process for public schools. HB 425, sponsored by Rep. Joyce Chandler (R-Grayson) would strongly encourage the State Board of Education and local school systems to allow the administration of standardized tests in pencil and paper format. The bill would also ask the State School Superintendent to develop guidelines that would be approved by the State Board of Education to strongly encourage how local school systems should handle students who do not participate in state-wide assessments. HR 686, sponsored by Rep. Kevin Tanner (R-Dawsonville), creates the House Study Committee on Equitable Local Education Funding to include three members of the House of Representatives. This study committee will present an excellent opportunity for us to engage with key influencers on the local education funding process over the interim period. We will monitor this closely throughout the interim period and report on any relevant developments in real time. Status: This resolution was approved by the House and is awaiting appointments. SB 30, sponsored by Sen. Vincent Fort (D-Atlanta) would create a pilot program for Sustainable Community School Operations Grants and would allow the Department of Education to issue grants to plan, implement, and improve sustainable community schools. In the Senate version of the fiscal year 2018 budget $50,000 was appropriated to allow for grants to be remitted, but the funding was not included in the conference committee report on the budget. Status: This bill was approved by the Senate and was later attached to HB 430 in the House but was removed (deleted) before coming back to the Senate for agreement to the House changes. The 2017 session of the Georgia General Assembly is scheduled to adjourn Sine Die next week on Thursday March 30th. “Cross-over day,” the day by which all bills must be approved by their chamber of origin in order to remain in consideration, occurred on Friday, March 3rd. The committees in each chamber have been working nonstop since that time to move bills to their respective rules committees. From there, the rules committees determine which bills move to the floor of each chamber for a vote. The House and Senate came to an agreement this week on the fiscal year 2018 budget in the form of a conference committee report. Leadership from both chambers worked to resolve the differences between the House and Senate versions of the appropriations packages and the result of those negotiations is represented in the conference committee report. The budget is the only piece of legislation that the General Assembly is constitutionally required to pass during their 40-day session. HB 338, sponsored by Rep. Kevin Tanner (R-Dawsonville) has been renamed the “First Priority Act” and has been amended several times throughout the legislative process including a change that prevents for-profit entities from operating schools under the terms of the legislation. A change was also made to the formation of the education turnaround advisory council in order to include more representation from the education community and their respective associations. Finally, $1,000,000 in funding for the implementation of the bill was added to the conference committee report on the fiscal year 2018 budget. Status: This bill has been approved by the Senate Education Committee, and awaits movement to the Senate Floor via the Rules Committee. HB 237, sponsored by House Education Chairman Brooks Coleman (R-Duluth). This bill, which has been characterized as a piece of legislation meant to support the intent of HB 338, would authorize the Public Education Innovation Fund to receive private donations that could be used as grants for public schools, and establishes a tax credit for such a donation. The legislation was changed in the Senate to reduce the maximum amount of tax credits available and the length of time that they are available for. Status: This bill was approved by the Senate Finance Committee, and awaits movement to the Senate Floor via the Rules Committee. SB 30, sponsored by Sen. Vincent Fort (D-Atlanta) creates a pilot program for Sustainable Community School Operations Grants and would allow the Department of Education to issue grants to plan, implement, and improve sustainable community schools. In the Senate version of the fiscal year 2018 budget $50,000 was appropriated to allow for grants to be remitted, but the funding was not included in the conference committee report on the budget. Status: This bill was approved by the House Education Committee, and is now in the House Rules Committee where it will be considered for movement to the House floor. SB 211, sponsored by Senate Education Chairman Lindsey Tippins (R-Marietta) seeks to clarify many of the provisions of SB 364 that were signed into law in 2016. Specifically, the legislation directs local districts along with the Department of Education to pursue maximum flexibility from the federal government in terms of the tests that are administered and required in public schools. Status: This bill has passed out of the House Education Committee, and is awaiting movement to the House Floor via the House Rules Committee. Status: This bill was approved by both the House and Senate and will be transmitted to the Governor’s desk. House Education Committee Chairman Brooks Coleman is organizing several listening sessions to gather feedback from educators on Education Reform Commission proposals and other legislative changes. The most recent session was held in Watkinsville last week, and GSTA was on hand to take the pulse of teachers who came from as far away as Fulton County. Speakers generally spoke against the over-reliance on testing and the proposed move toward merit pay. A GSTA member who addressed the committee spoke in favor of STEM education and expressed concerns about the rigor of some Move On When Ready courses that take the place of advanced high school courses. GSTA President Brian Butler will be submitting official comments to the committee on behalf of the organization. The next session will be held Tuesday, August 19th, from 6:00 until 8:00 pm at the UGA Tifton Campus Conference Center. Follow this link for details. We encourage you to take advantage of these opportunities to speak up for your students and for science education in Georgia. In the early morning hours of March 25th, the Georgia General Assembly completed the final day of the 40-day legislative calendar and adjourned “Sine Die.” Upon adjournment, the Governor has 40 days to sign or veto bills (this year he will have until May 3rd). If the Governor does not sign a bill or veto it, it will automatically become law. The Governor has the power of line-item veto over the budget bills. Status: Although the House removed some of the funds included in the Governor’s budget, the Senate added a portion of them back in and the conference committee struck a compromise between the two. In the final conference committee report adopted by both chambers, the curriculum funds were included. The FY 2017 budget is now on the Governor’s desk where it awaits action. SB 364, sponsored by Senate Education Chairman Lindsey Tippins (R-Marietta). This bill seeks to reform the use of standardized tests in the evaluation of both students and teachers. A major focus of the bill is to pivot from summative assessments to formative evaluations in math and reading. Of note, the bill requires science end of course tests to be administered annually in grades five and eight. The House version of the bill incorporates provisions of HB 1061 including the provision that would require that teachers be evaluated on a students’ achievement only if the student attends at least 90 percent of instructional days for the course in question. Status: The Senate agreed to the House’s changes to this bill and it is now on the Governor’s desk awaiting action. SB 355, sponsored by Senator William Ligon (R-Brunswick). This bill originally sought to enact numerous reforms to the use of standardized tests and Georgia’s teacher evaluation system. The bill was revised in the Senate to address standardized test opt-out procedures and seek to prevent teachers and administrators from being penalized when a student does not take a mandated test. Status: This was approved by the House and is now on the Governor’s desk awaiting action. HB 801, sponsored by House Speaker Pro Tempore Jan Jones (R-Milton). This bill, which has strong support from House leadership, seeks to allow the University System of Georgia to add GPA weights to certain STEM courses which would exclusively impact a student’s HOPE GPA. The purpose of the bill is to prevent students from avoiding STEM courses because of the impact that the rigor could have on their HOPE scholarship eligibility. Status: The House agreed to the Senate changes to this bill and it is now on the Governor’s desk awaiting action. HB 739, sponsored by Rep. Kevin Tanner (R-Dawsonville). This bill, which was drafted in consultation with the Department of Education and numerous school districts, seeks to bring greater transparency to the instructional materials adoption process. The bill would make the statewide materials adoption process optional and require local districts to institute an instructional material review process that includes an easily accessible public notice and a parental component. Status: This bill was approved by both the House and the Senate and is now on the Governor’s desk awaiting action. HB 1061, sponsored by Rep. Tom Dickson (R-Cohutta). This bill seeks to reduce the impact of assessments on teacher evaluations. It also seeks to require that growth in student achievement as measured for teacher evaluation purposes only be used if the student attends at least 90 percent of instructional days for the course in question. The bill does not seek to change the number of state mandated assessments in any specific subject matter area. Status: This bill was considered by the House Education Committee but did not receive a vote. It did not achieve final passage this year. The State Board of Education will hold a public hearing and vote on adoption of the revised science standards next Thursday, March 31st. This will culminate a nearly 12-month process that has been driven by teacher input at every step. The public hearing will provide one last opportunity for science teachers to speak up in support of high-quality science standards for our students. If you are not able to attend the hearing, then please consider contacting your State Board member to voice your support for the revised standards. See below for additional information. · You can view the meeting agenda here:https://eboard.eboardsolutions.com/Meetings/ViewMeetingOrder.aspx?S=1262&MID=49363. The meeting will begin at 9:30 am, with the public hearing following fairly soon thereafter. · If you click on item E.1. on the agenda, you’ll see the final proposed version of the standards as they have been recommended to the board. The crosswalk document, displays the original standards, the initial revision, and the final revision in parallel. There have been some wording changes based on public comments, but I think the core of the work from the original teacher survey and working committees is preserved. · The actual board vote will come later in the meeting, as you can see on item I.1. By clicking on that item, you can see the larger number of support letters, including one from GSTA, that were submitting in addition to the public comments. You will also notice that the standards are coming to the board with a recommendation to adopt from the Superintendent and DOE leadership. On Wednesday March 16th, the Georgia General Assembly completed the 38th day of the 40-day legislative calendar. At this point in the session, most committees have finished their work and the remainder of the action will be on the floor or in the Rules Committee of each chamber. Any piece of legislation that has not been approved by both the House and Senate on March 24th will be dead for the year. Once the General Assembly adjourns on March 24th, the Governor will have 40 days to sign or veto bills (this year he will have until May 3rd). If the Governor does not sign a bill or veto it, it will automatically become law. Status: Both the House and the Senate approved their respective versions of the budget. The House officially “insisted” on their position, which sent the budget to a joint conference committee for reconciliation. Before March 24th, each chamber will approve the final conference committee report. Status: This bill has been approved by the House and must return to the Senate for an “agree” motion on the House changes before it heads to the Governor’s desk. SB 355, sponsored by Senator William Ligon (R-Brunswick). This bill originally sought to enact numerous reforms to the use of standardized tests and Georgia’s teacher evaluation system. The revised version of the bill approved by the House addresses standardized test opt-out procedures and seeks to prevent teachers and administrators from being penalized when a student does not take a mandated test. Status: This bill was approved the House Education Committee but has not yet been selected by the House Rules Committee for a vote on the House floor. Status: This bill has been approved by the Senate and must return to the House for an “agree” motion on the Senate changes before it heads to the Governor’s desk. Status: This bill has been approved by both the House and the Senate and will now be transmitted to the Governor for his consideration. Status: This bill was considered by the House Education Committee but did not receive a vote. It is no longer eligible for consideration this year in its current form. The House Education Committee met this afternoon for the second time to discuss SB 364, (substitute version attached), authored by Sen. Lindsey Tippins. Prior to the bill presentation from the author and public testimony, House Education Chairman Brooks Coleman took the time to address a report circulated by the Professional Association of Georgia Educators that the Governor reached out to the committee to ask them to hold the bill. Chairman Coleman dismissed this claim as being as far from the truth as an association has ever strayed. Relating to classroom evaluations on line 125, multiple evaluations is not limited to a specific number however teachers with the two highest tiered evaluation scores (professional and exemplary) are only required to undertake two evaluations. On line 174, SB 364 removes the Social Studies and Science assessments in grades 3,4, 6 & 7. By reducing these 8 tests, the total testing days is reduced from 32 to 24. Under Section 3, relating to appeals and other issue areas, the House version did not include language creating an appeal process for teacher evaluations. The Committee did not want to adjust this, and the language only grants an appeal for further action for procedural errors on behalf of the evaluators. Chairman Tippins closed his remarks by voicing his commitment to advancing the interests of public education in the state, and that any future legislation should focus on leaders arguing student issue areas and crafting policy that was both meaningful and impactful to Georgia’s students. Following the author’s presentations, public testimony was heard from over thirty members of the public voicing their strong support to the committee for addressing their concerns. Those testifying in favor of the measure included the State Department of Education, GAE, PAGE, the Georgia Association of Education Leaders, TRAGIC, and many other educators representing themselves. The committee adjourned without a vote but committee members will be allowed submit any recommendations or amendments to the legislation to the committee administrative aide before Wednesday afternoon. Chairman Coleman indicated that the he plans to call a vote on the final version of the House legislation Fridaymorning at 8:30 AM. Chairman Coleman also indicated that the reading/mathematics mandate would be put back into the House version of SB 364. Senate Education and Youth Committee Chairman Lindsey Tippins' (R-Marietta) assessment bill, SB 364, (substitute version attached), was heard for the first time in the House Education Committee Wednesday. We expect that the bill will be heard again next week and could be voted on at that time or at a later date. Following is a summary of the House hearing. Chairman Lindsey Tippins began his presentation to the House Education Committee on SB 364 by noting that this legislation needs to pass in order to support teachers and the education workforce at large. Chairman Tippins noted that he has heard from many constituents and others across the state that public education is failing the teachers in Georgia and there hasn’t been a substantial policy change on assessments or teacher evolutions in nearly 50 years. Chairman Tippins framed his discussion in the context of what he believes needs to change and noted that like any good policy initiative, it will take time to get to the point where the public at large is satisfied with the policy. He remarked that SB 364 was designed to craft a model that is best for the local school district, and that the legislation seeks to reframe the conversation about student and educator efficiency and increased effectiveness in public education. He closed his remarks by clearly stating that this legislation is moving forward in one form or another, as it is one of the Senate Republican Caucus’ top priorities this session. Reduces state mandated tests from 32-24 by eliminating social studies and science tests in grades 3-4 and 6-7. Students would be tested in these subjects in grades 5 and 8. Chairman Tippins continued by noting how the legislation is designed around education inputs rather than education outputs and is intended to be a “minor reduction” in testing. He also noted that Georgia requires three times the amount of testing that federal government requires. SB 364 is crafted to allow for teacher and educational flexibility, but is also based on the notion that all students should be evaluated properly. Finally, the Chairman expressed that he will not negotiate on mandated reading/math skills by the time a student enters the 6th grade. He cautioned the committee that the State and the Department of Education do not need to hold teachers accountable for areas outside of their control, and that the most effective model he has seen is the use of frequent formative assessments. He closed his presentation to the committee by detailing the provision in the bill that allows the local system to keep their current model of testing/evaluation if they can show the DOE through data/results that the model is working. Supt. Woods responded that local systems can require additional tests (benchmark testing) that is directly tied to accountability, and that the Department does not mandate the systems to perform more tests. The committee received a copy of a matrix showing the state required tests v. federally required tests v. an aggregate of what local school systems test. Rep. Tommy Benton asked Chairman Tippins if there had been discussions in the Senate process about using MAP in the bill? Chairman Tippins responded that the bill addresses this in K-5 grade, but that the local system, the education committees and other thought leaders have to determine which assessments give the teachers and the administration the best feedback. Chairman Randy Nix specifically asked about a provision on page 3 relating to the student growth (30%) a minimum of 20% on state assessments, and what the thought process was from going from 50% -20%. Chairman Tippins responded that the other 10 percent is multiple indicators of student achievement (20% has to be Milestones) and remarked that a single test on single day in a high stakes format is not the best indicator of student growth or achievement. Chairman Randy Nix continued by asking about the provision on Line 79, which eliminates the state board approval of SLOs. Chairman Tippins interrupted Chairman Nix and told the committee that the proposed legislation is eliminating SLOs as they are designed today, but that they are not eliminating the approval process. Rep. Margaret Kaiser asked if there is going to be flexibility for formative assessments for charter schools? Chairman Tippins responded that a clarification needs to be be made in the current version of the bill for public charter schools, and that particular issue hasn’t been discussed yet. Rep. Mike Dudgeon asked Supt. Woods if he could offer his vision of SLOs/student growth for five years from now? Supt. Woods responded that he envisioned the Department looking at one growth measure, where they would still have pre/post tests, and that the administration would work with the teacher to give them flexibility at the local level to determine success. This drastically cuts down on the required number of tests (next year is only two growth measures). Rep. Mike Dudgeon continued by remarking to the committee and the audience that the legislation is not dramatically decreasing testing days as opponents would contend, but rather the proposal is to move from 32 testing days to 26 testing days. Rep. Valencia Stovall asked specifically about lines 13-14, relating to development. She asked if there had been consultation with stakeholders that would include parents/students? Chairman Tippins responded that the parents are the stakeholders, and that if the parents want to be involved then they will be involved. Chairman Randy Nix closed the hearing, as a sponsor of the House counterpart to the bill, and expressed his thanks to Chairman Tippins and Supt. Woods for their hard work thus far on the bill. Chairman Nix said that his only reservations about the current form of the bill are that there is not an appeal process for the teachers to adjust their evaluations. Chairman Nix closed by saying that he hoped a hybrid bill of his legislation (HB 1061) and SB 364 could be put together to move the state’s teachers forward and remove onerous and burdensome provisions on them in the future. On February 25th, the Georgia Science Teachers Association held its first annual “Day at the Capitol.” GSTA members from across the state descended on the Capitol to meet with state legislators and speak with them about relevant issues before the General Assembly. During the morning session, GSTA members met privately with key influencers such as Senate Education Chairman Lindsey Tippins (R-Marietta), House Majority Leader Jon Burns (R-Newington), House Education Chairman Brooks Coleman (R-Duluth), and House Education Committee member Beth Beskin (R-Atlanta). 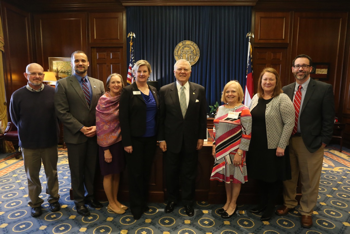 Later that morning, the group met Governor Nathan Deal (see picture below) and was honored in the Senate Chamber by Senator David Lucas (D-Macon) with Senate Resolution 709. In the afternoon, each GSTA member met with their local legislators to discuss the importance of the science standards review process and the GSTA’s legislative priorities. Members of the group spoke with Senate Majority Leader Bill Cowsert (R-Athens), Senate Science & Technology Chairman Bruce Thompson (R-Canton), Governor Nathan Deal’s Senate Floor Leader Butch Miller (R-Gainesville), Senator Bill Ligon (R-Brunswick), Senator Nan Orrock (D-Atlanta), Senator Frank Ginn (R-Athens), Representative Spencer Frye (D-Athens), and others. On Monday February 29th, the Georgia General Assembly completed the 30th day of the 40-day legislative calendar. This day was the deadline for legislation to “cross-over” to the opposite chamber in order to remain in consideration. Legislators who sponsored legislation have from now until March 24th to move that legislation through the committee process and to the Governor’s desk. Status: The House version of the budget reduced those funds slightly in accordance with agency-wide reductions, and the Senate is now considering the budget in committee. Once the Senate approves the budget it will move to a joint conference committee for reconciliation before each chamber approves the final conference committee report. SB 364, sponsored by Senate Education Chairman Lindsey Tippins (R-Marietta). This bill seeks to reform the use of standardized tests in the evaluation of both students and teachers. A major focus of the bill is to pivot from summative assessments to formative evaluations in math and reading. Of note, the bill requires science end of course tests to be administered annually in grades five and eight. Status: This bill has been approved by the Senate and will now move to the House for consideration. SB 355, sponsored by Senator William Ligon (R-Brunswick). This bill originally sought to enact numerous reforms to the use of standardized tests and Georgia’s teacher evaluation system. The revised version of the bill approved by the Senate addresses standardized test opt-out procedures and seeks to prevent teachers and administrators from being penalized when a student does not take a mandated test. Status: This bill has been approved by the House of Representatives and is now eligible for consideration by the Senate Higher Education Committee. The University System of Georgia, Technology Association of Georgia, and numerous other key stakeholders are supportive of this bill. Status: This bill has been approved by the House of Representatives and is available for consideration by the Senate Education & Youth Committee. HB 734, sponsored by Rep. Jason Spencer (R-Woodbine). While this bill it outside of education, we were introduced to it during our Capitol visit. The bill would facilitate the development of space flight-related business activities within Georgia, with a goal of increasing the number of STEM-related jobs available in the state. Status: This bill was passed by the House Monday and will now move to the Senate for consideration. The Senate Education & Youth Committee met this afternoon to discuss SB 364, sponsored by Senate Education Chairman Lindsey Tippins (R-Marietta). SB 364, Tippins explained, is an attempt to alleviate some of the excessive testing requirements that are placed on students and teachers in Georgia. Tippins noted that despite the relief from a number of federal testing requirements provided by President Obama’s B.E.S.T. Act, there are still issues with the state standardized testing model. Tippins explained that the current model takes students out of the instructional learning setting and puts unnecessary burdens on the teachers and administrators. He briefly went through the various provisions of the bill, and although the discussion was ‘hearing only,’ a substitute bill will be written to address errors in the current draft. The main purpose of the bill, however, will remain the same. Following Tippins' overview, representatives from GAE, PAGE, TRAGIC, Georgia Association of Educational Leaders, Educators First, various teachers and administrators from around the state, and State School Superintendent Richard Woods spoke in strong support of the bill. The bill is expected to be passed by substitute in a follow up hearing next Monday. We strongly encourage you to review the bill for yourself and to provide your input both to Education and Youth Committee members and to your local legislators. You can find contact information through the links below.